"A hero in no one's story"
Poet’s Notes: This poem came to me when I was going to sleep. I scribbled down a few lines to not lose the inspiration and then I finished it on the subway a few days later. The central inspiration was in the verse, "The hero of no one's story"—the final verse, as it turns out, in the finished poem—on the death of someone whose life had no meaning. It is true that we are all the main characters in the stories of our lives, but there are some of us who do not matter; some of us who go through life with virtually no affect on others, who are, in effect, never the hero of any story. The fixation on smallness and obscurity reflects upon this central theme with even the name of the person—who "could've been a child['s] / it could've been a man['s]"—washed away by time. The grave is hidden; its location not even in a cemetery, and perhaps it is not even a grave at all, but a warning to us to leave our mark when we can, lest we fade to nothing ourselves. (Good thing I've so many poems in publication, I suppose! I'm shoring up my immortal fame...after a fashion, at least). I often walk through Greenwood Cemetery as I live about two blocks away, and it is the single most beautiful spot in any of the five boroughs of New York. There are many gravestones there that are badly eroded, having been made of soft rock. My great great grandmother is buried there, and the stone is so eroded you cannot make out more than a letter or two on the whole stone. This partially inspired elements of the poem, especially as Greenwood is a slice of the country in the midst of South Brooklyn, but the inspiration is not exact. 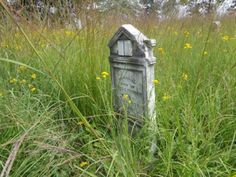 In the poem, the gravestone is set in a country field near a small, nameless creek; Greenwood has no creeks (sadly!) and has no places quite so obscure as this (though there are some tucked away graves I like to spend time near). The poem is rather simple aesthetically, but I think it captures the mood well, and was only altered in so much as I needed to alter it for the sake of enhancing that feeling. It did not need much work, and I was well satisfied with the result relatively quickly. Editor's Note: I took the editorial liberty of choosing a small font size for the title--a bit of word painting to enhance the theme.